As I noted previously, we love our Keurig coffee system. My mom got it for us for Christmas a couple years ago, and it is, hands-down, our most used kitchen gift ever. It is SO convenient and easy to drop a new K-Cup into the brewer and push a button. A minute later, a perfect cup of hot coffee awaits! We also love the large range of brands and flavors that are available in the K-Cup system now. 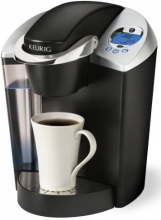 Keurig coffee systems get great reviews, and it’s no wonder why. They’re so convenient, and they’re priced reasonably if you consider how many days out of the year a family uses it — and possibly even multiple times per day, like us. Because Keurig systems make such great gifts, either for your household or another, I’m pulling together some of the best deals for 2012 at various online retailers to help you get a jump start on Black Friday. On Friday, prices may go even lower on a specific model or at a specific retailer, so watch those prices, and take advantage of low prices while you can. * Some Amazon items are eligible for free 2-day shipping if you have a Prime account. And if you’re shopping for a Keurig, don’t forget to start off with a nice set of K-cups of your favorite coffee brand or flavor.